Air: Scoring A Cinematic Marvel, 100 Years Later The duo wrote original music for a sparkling new restoration of Le Voyage Dans La Lune, Georges Melies' groundbreaking science-fiction film. Nicolas Godin and Jean-Benoit Dunckel pose at a January screening of Le Voyage Dans La Lune at New York's Museum of Modern Art. In 1902, director Georges Melies released his magnum opus: Le Voyage Dans La Lune (A Trip To the Moon), often considered the first science-fiction movie ever. Even if you've never heard of Melies, you've probably seen the film's most famous shot: a moon with a human face, wincing at the spaceship that has just crashed into its eye. What almost no one has seen since the film's original release is its true color palette. Modern audiences know Le Voyage as a black-and-white movie, but in fact, Melies hand-painted each frame of the film for special screenings. Those hand-painted reels were lost for decades; when they were discovered in Barcelona back in 1993, archivists began a years-long process of repairing the badly damaged film. 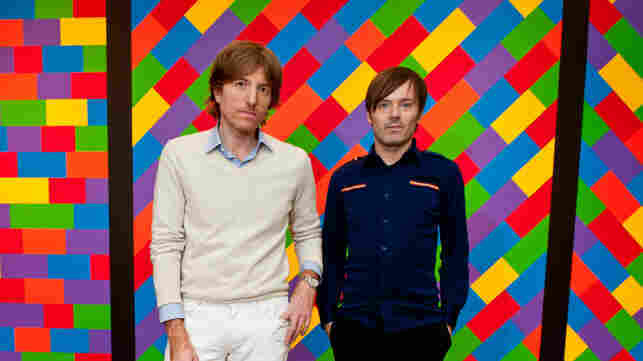 For its soundtrack, they asked Nicolas Godin and Jean-Benoit Dunckel — the French duo known as Air — to put together an original score. The new restoration debuted at the Cannes Film Festival in May, and the soundtrack album is coming out in a few days. Godin and Dunckel tell NPR's Guy Raz that as exciting as it was to write the music, the real thrill was seeing the movie the way Melies intended. "It's like another movie — you don't look at it the same way," Godin says. "The color makes the movie very modern, like something as entertaining now as it was in the past. The black-and-white version is more like a piece of a museum." Dunckel says the duo watched the movie every day for a month — and that by the end, he started to feel like a part of the original film crew. "I can recognize on the screen any character, any woman, any man. I can see how much fun they had. I can feel the energy, the fact that they were so young at the time," Godin says. "I felt part of the whole process." Watch a scene from the restored version of Le Voyage Dans La Lune, featuring original music by Air.